Goodbudget for the Web, version 2.3 is out! This was a big release with some cool new features and changes in our system to help us serve you better. Read on for a few of the highlights. This new email report will highlight the envelopes you’ve overspent on, as well as the ones you’ve underspent on so you can make any necessary adjustments to your budget. For those of you who manually fill your envelopes each month, this feature will help you create “Custom Quick Fills” to make the process of adding income to your envelopes even faster. Before when you created a future transaction it would post immediately. Now when you create future transactions they show up as “pending” until the date you chose. It works just like you expect it to. In this release we made many, many, many bug fixes. Good work, love the changes so far! I really appreciate the “pending” fix. However, I’ve noticed that at least one of my “pending” transactions doesn’t show up when I view just the envelope or just the account that it’s in. I only see the pending transaction when I view all transactions and filter by payee. Send us an email at support@goodbudget.com with your Household Username so we can take a look! Are the pending transactions supposed to automatically subtract on the date scheduled? I have to go the website and select the now button to subtract on the date I scheduled. They do not show at all in iphone app. Are they supposed to? I would at least like to be able to click on the envelope and see a true balance with my pending transactions subtracted. Every week I put in the transactions for the week, so the money is actually spent and I liked it better when the envelope balance reflected that. Thanks for any help in the matter. Hi Jennifer, that’s a good question. It’s true that all future-dated transactions created on the web will show up as pending, and post on the day that you chose so that your Envelopes accurately reflect you have available today. You can’t see pending transactions on the mobile platform right now. Future-dating a transaction on your phone will post the transaction right away as you expect it to. 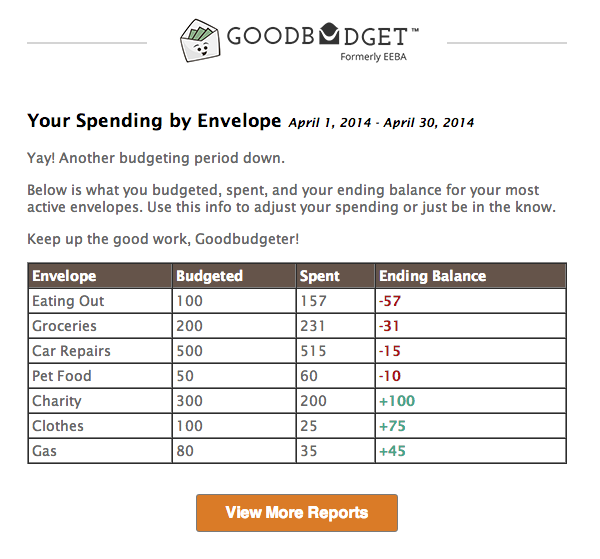 Does an email with a budget snapshot automatically come, or do I need to sign up for it? When should I expect my first one? I love that feature! Click on the “My Household” link on the top right of the website, then make sure you’re opted-in to the Newsletter. The end of budget period emails follow the same email list. Thanks! Hi, I’m Brian. I’m a part of the Goodbudget team. We’ve had some technical difficulties with the new email report and will comment on this thread when it’s fixed and launched. Sorry about the inconvenience. Reach out at support@goodbudget.com with any questions. Thanks!